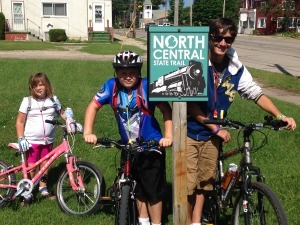 North Central State Trail lies between Gaylord Michigan and Mackinaw City Michigan. It is a beautiful 61 mile crushed limestone trail. The old rail corridor turned trail makes it is fairly flat which makes for an easy biking experience. The trail passes through small towns like Vanderbilt, Wolverine, Topinabee, Indian River and Cheboygan. The Sturgeon River and Mullet Lake are added beauty along the way.